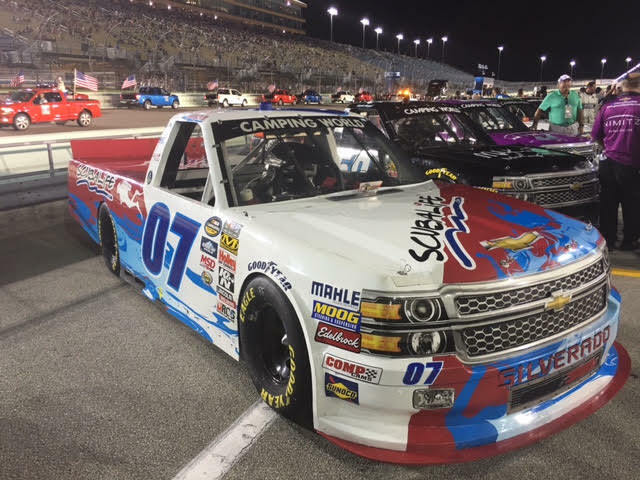 HOMESTEAD, Fla. (November 21, 2015) – NASCAR driver Ray Black Jr. rounded out his debut year in the NASCAR Camping World Truck Series (NCWTS) with his ninth straight Top-20 finish when he placed 18th during the series finale race at Homestead-Miami Speedway this past Friday. The driver of the No. 07 ScubaLife.com Chevrolet, who hails from Flagler Beach, Fla., finished the season strong in front of a home-state crowd by fighting off his competition to maintain the 11th place position in the championship standings. Handling was a key challenge during Black’s race weekend. The truck was too snug during the series’ only practice session, forcing the team to make some big changes to it. During qualifying, Black then worked hard with a very loose truck to line up 27th for the Ford EcoBoost 200. Once the green flag dropped Friday night, Black made quick work of the field and moved up 10 spots by Lap 50. As the laps wound down, Black’s lap times got faster and matched trucks running in the Top-10. After a strategic call during the third pit stop of the night to take fuel only, Black lined up sixth for what would be the final restart of the night. Unfortunately, a poor restart by the leaders of the race caused a pile-up to spread throughout the field and resulted in some left rear damage for Black. Despite a little bit of a tire rub, Black persevered through the final laps of the race to secure a Top-20 finish and 11th place in the NCWTS standings. Keep up with all the latest offseason news on Ray Black Jr. by following him and his sponsor, ScubaLife, on Facebook, Twitter and Instagram at @TeamScubaRacing and @RayBlackJr.